Eight Antelope Valley residents were among the 24 gang members and associates indicted for their role in a massive drug trafficking network that operated in the San Gabriel and Antelope Valleys, authorities announced Thursday. 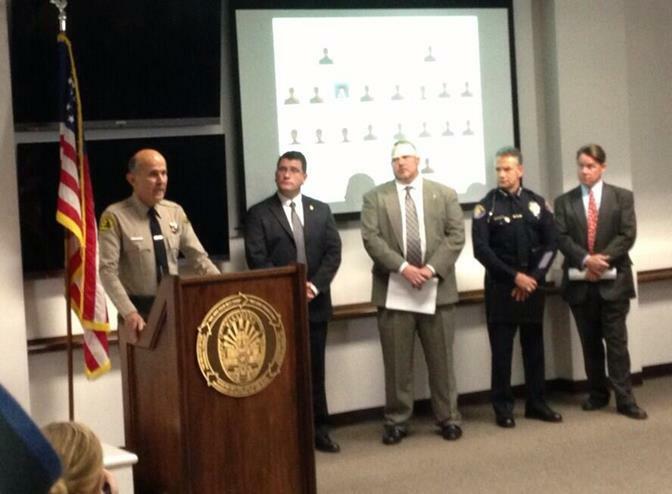 A multi-agency investigation into gang-related crime in the San Gabriel Valley has led to federal charges against 24 members and associates of Pasadena-based gangs and drug trafficking organizations in the San Gabriel and Antelope Valleys for their roles in a narcotics network in which methamphetamine, cocaine and heroin were supplied from Mexico and distributed widely in southern California. The announcement was made on behalf of multiple agencies participating in the San Gabriel Valley Safe Streets Task Force, to include the Drug Enforcement Administration; the Pasadena Police Department; the Los Angeles County Sheriff’s Department and the FBI. A federal grand jury in Los Angeles returned three indictments on December 3 that were unsealed Thursday and charge the defendants with a variety of violations relative to the narcotics distribution networks. Two of the defendants were already in custody prior to Thursday’s operation; two of the defendants were deported; three of the defendants are unidentified subjects; 12 defendants were arrested during Thursday morning’s operation; and five are considered fugitives. In addition, task force members executed 10 federal search warrants at locations throughout the region to seek evidence linked to Operation Rosebud. Operation Rosebud targeted the street gang known as “Vario Pasadena Rifa” (VPR) whose members are known to distribute large quantities of methamphetamine in the city of Pasadena and surrounding areas in the San Gabriel Valley. VPR operated through a network of suppliers that facilitated the delivery of pure methamphetamine from Mexico through southwest states and ultimately to local destinations. The task force seized more than 60 pounds of methamphetamine, heroin and powder cocaine from sources linked to the drug trafficking organization. Early in the 18-month investigation, defendant Edwin Ayala was identified as a supplier of methamphetamine to VPR members, as well as members and associates of other area gangs. The task force investigation revealed that Ayala was being supplied with methamphetamine by defendant Jose Villa, also known as “Kex,” and additional defendants who were allegedly supplying Villa, including a defendant (release of name pending) who is believed to receive his supply of multiple pound quantities of methamphetamine from Sinaloa, Mexico. Jose Salvador Villa, 37, West Covina, Arrested; Dora Alicia Vasquez, aka “Dora Sanchez,” 29, Pasadena, Arrested; Ernest Gabriel Alderette, aka “Ernie,” “Turtle,” 32, Pasadena, Arrested; Edwin Benjamin Ayala, aka “Dex,” 34, Altadena, Arrested; Francis Kolbjornsen, 29, Hawthorne, Arrested; Juan Carlos Garcia, 26, Norwalk, Fugitive; Three fugitives (release of names pending); Jose Daniel Rivera, aka “Clumsy”, already in federal custody on unrelated charges; Unidentified Coconspirator, #145#, aka “Cousin”; Unidentified Coconspirator, “163”, aka “Junior”; Unidentified Coconspirator, “2574”; Christopher Thomas Delgado, aka “Shorty,” already in state custody on unrelated charges; Argenis Ariel Rosales, Deported; Jose Ramos Martinez, aka “Timido,” Deported. During Operation Rosebud, the task force seized approximately 60.5 pounds of methamphetamine, 6 pounds of tar heroin and 5 pounds of powder cocaine from sources linked to the drug trafficking organizations operated by Villa. The estimated street value of the narcotics exceeds $2.5 million. The task force also seized four vehicles and approximately $40,000 in cash. Additional evidence, including items associated with methamphetamine production, were seized during [Thursday]’s search. This indictment alleges that defendant Delgado obtained narcotics from unindicted co-conspirators and arranged for its distribution in various areas, including Lancaster and Rosamond, California. Other defendants obtained narcotics from Delgado and further distributed it, stored it or delivered it to couriers, according to the indictment. The three indictments outline a series of narcotics transactions in varying quantities and at varying prices negotiated by the defendants using used coded language on phone and text conversations to disguise drug transactions. The government is also pursuing forfeiture allegations in order to obtain property or proceeds obtained as a result of the alleged illegal activity. During Thursday morning’s operation, at least five minor children were removed by the Department of Children and Family Services from defendants’ residences.